Meet Our Staff – Mark Keeney Jr.
Meet Mark Keeney Jr., the customer relations and product support specialist at Marvel Schebler. Mark mans the phones at the office and helps solve client’s problems on a daily basis. 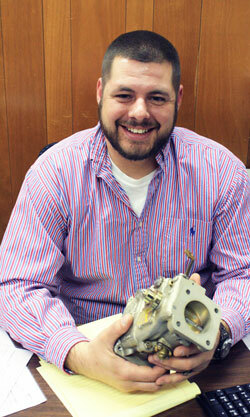 For application data, carburetor assembly questions, or anything else, Mark is there to help. So how did Mark become an expert in such a complex industry? According to him, it all began with his knack for remembering different carburetor part numbers and being able to memorize troubleshooting guides. Initially, owner Tim Henderson was also a “wealth of knowledge” to Mark. “I think for the first two years my catch phrase was ‘Let me call you back.’ Talking to the guys with experience on the job is how I got it down,” said Mark. Surprisingly enough, before working with Marvel Schebler Mark had never been on an airplane! His first real flight was on a business trip from Cincinnati to Seattle. “The flight was about six hours, so if I didn’t like it I had a lot of time to sit there and not like it,” said Mark. Now, however, Mark is a seasoned pro when it comes to traveling. Outside of work, Mark enjoys playing softball, riding his Harley Davidson motorcycle, and spending time with his wife and two children. He is a big West Virginia football fan and enjoys an on-going rivalry with a friend who supports Oklahoma. So if you end up needing technical help with your aviation carburetor you are likely to find out what a great asset Mark Keeney, Jr. is to Marvel Schebler and the general aviation world. Marvel-Schebler® is a registered trademark of Marvel-Schebler Aircraft Carburetors, LLC. Website contents © 2011-2018 All Rights Reserved.